PABLO PICASSO is one of the most influential and celebrated contemporary artists of the 20th century. 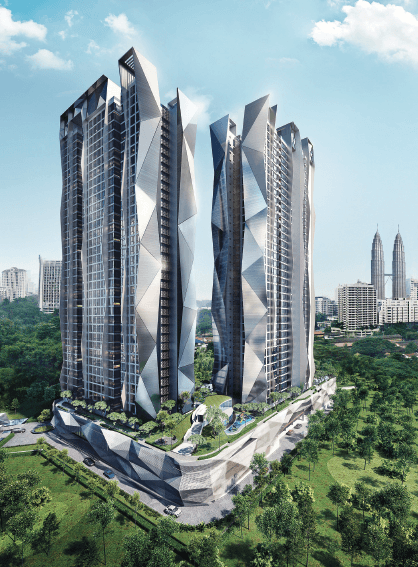 Inspired by his works, a new residential development off Jalan Ampang in Kuala Lumpur has been named Picasso Residence. The maiden project of Premier De Muara Sdn Bhd — a joint venture between Almaharta Sdn Bhd and Premier Gesture Sdn Bhd — has a gross development value of RM600 million. Premier Gesture is a wholly-owned subsidiary of PRG Holdings Bhd, formerly known as Furniweb Industrial Products Bhd, a public listed investment holding company that manufactures and sells upholstery webbings, yarn and metal components. Since commencing operation in 1983, PRG has diversified into niche products for the textile and apparel, furniture, automotive, food packaging and medical industries. Last year, the company’s shareholders agreed to change its principal activity to property development. PRG has since set up a team with extensive experience in the property and construction sector. “The reason for venturing into property development is to diversify our businesses as we believe there will always be demand and opportunities in this sector,” Premier De Muara director Steven Hooi Kok Hoe tells City & Country. The development’s concept is influenced by the works of the Spanish artist, he explains. Sitting on a 3.93-acre leasehold parcel, Picasso Residence will comprise two 38-storey towers with 270 and 202 residential units respectively. There will be six to eight units to a floor with four types of layout to choose from. Those with built-ups of 1,013 sq ft will have 2+1 bedrooms and two bathrooms, while the 1,375 sq ft and 1,668 sq ft units will have 3+1 bedrooms and three or four bathrooms. The dual key units with built-ups of 2,407 sq ft or 2,480 sq ft will have 4+1 bedrooms and five bathrooms. Premier De Muara general manager of property Andy Tan Choong Wei says the developer has chosen to offer fairly bigger units in Picasso Residence, as opposed to following the current trend of building smaller units such as studio apartments and small office/home office units. “We have confidence in this product as we are offering units that are more family-oriented, which we think are lacking in the area. Also, our development aims to provide an artistic and luxurious lifestyle as well as a relaxing environment. We believe there will be a demand for it,” he adds. For the dual key units, homeowners can opt to rent out the attached studio apartment that shares a private lift foyer with the main unit, says Hooi. “With the variety in sizes and layouts, it has something to offer everyone, from young working adults to families,” he adds. The 2+1-bedroom units will be allocated one parking bay while the 3+1-bedroom units will have two and the dual key units three. The will be 1,000 parking lots on five levels — a semi-basement level and four levels on top — including visitor bays. According to Hooi, the parking spots provided will be sufficient as the development is within walking distance of LRT stations. He adds that owners can opt to purchase additional parking bays. The units will be partly furnished and will come with built-in kitchen cabinets, stainless steel sink, hood and hob, and built-in oven. They will also have fully fitted bathrooms with hot water storage tanks, a washing machine and dryer, air-conditioning units in all the bedrooms, living and dining rooms, and a home automation system with a built-in security system. The attached studio apartment for the dual key units will come with a kitchen that will be similarly fitted. As each unit will come with a private lift foyer, Tan hopes it will encourage homeowners to decorate and enhance the space further, for example by adding art pieces. The facilities will be situated on the podium level (the 4th floor) as well as the rooftop. The main facility deck on the podium level will offer a 50m Olympic-sized swimming pool, bubble pool, sauna, floating cabanas, children’s pool, pool deck, 400m jogging track and walking path, yoga corner, barbecue terrace, parcourse, children’s playground, games room, glass-encased gymnasium overlooking the pool, sunken lounge, celebrity kitchen, changing room, Jacuzzi, reading room, management office, multipurpose hall, and possibly a launderette and nursery. The facility deck, which will be about 60,000 sq ft, will have water features to evoke a resort-like living environment. “The sunken lounge on the facility deck is where you can sit and be surrounded by water. Even the gym has that sunken effect,” says Tan. The facilities on the rooftop will include a sky pavilion, sky lounge, games room, garden swing, hammock garden, yoga deck, sky deck and sky park, which will be an ideal spot to enjoy the KL skyline and panoramic view of the Petronas Twin Towers and KL Tower. Picasso Residence will have three tiers of security, starting at the guardhouse and continuing to the lift lobby and each unit’s private lift foyer. Additionally, as each unit will be equipped with a home automation system that doubles as a security feature, homeowners will be able to control the locking and unlocking of doors as well as monitor visitors through the CCTV. Through the home automation system, homeowners can access the management bulletin and e-booking facilities where they can book function rooms and halls, among others, helping reduce the use of paper, says Tan. To further enhance the security, the master bedrooms will be equipped with a panic button that will be connected to the guardhouse, he adds. On the ground floor, the entrance of the grand lobby will have a double-volume drop-off porte-cochere and a spacious lounge. The developer plans to officially launch Picasso Residence on March 28. The units will be priced at RM1.09 million to RM2.83 million, and the maintenance fee will be 40 sen psf. The project is expected to be completed by March 2019. Picasso Residence is situated within a 3km radius of the Petronas Twin Towers. Its neighbours include the Embassy Row, which is home to a number of foreign embassies, international schools such as Sayfol International School and International School of Kuala Lumpur, medical centres including Gleneagles and HSC, shopping malls like Pavilion Kuala Lumpur, Fahrenheit 88, Great Eastern Mall and Ampang Point Shopping Centre, and a variety of restaurants. Other amenities nearby include the Datuk Keramat Lake Park and Sports Complex, Hock Choon International Grocer, Jarrod & Rawlins, Victoria Station, Alexis Bistro & Wine Bar, Souled Out, The Terrace at Hock Choon, Ampang Hilir Park, Raintree Club and Royal Selangor Raintree Polo Club. One advantage of living in or close to the city centre is the easy access to public transport. Picasso Residence is within walking distance of the Jelatek and Dato’ Keramat LRT stations, which puts it about three stops away from KLCC, eight stops from KL Sentral and 28 minutes from the Kuala Lumpur International Airport. It is accessible via the Ampang-Kuala Lumpur Elevated Highway (connecting Ampang to KLCC), Duta-Ulu Kelang Expressway (connecting Ulu Kelang to Jalan Duta, Mont’Kiara and Petaling Jaya) and Middle Ring Road 2 (connecting Bukit Jalil, Sunway, Puchong, Shah Alam, Kepong and Sungai Buloh). Meanwhile, Tan says upgrading works proposed by Dewan Bandaraya Kuala Lumpur for an interchange link to Jalan Desa Pandan and an underpass in Jalan Ampang and Jalan Jelatek will shorten travelling time. As regards the Goods and Services Tax, he believes people will adopt a wait-and-see attitude. However, the development’s location, price point and lifestyle it will offer will make it attractive to those who want to stay in the city, he says. With over 60 international embassies around Jalan Ampang, and being in close proximity to KLCC, the oil and gas hub, various multinational corporations and the Tun Razak Exchange financial hub, the development will see a strong rental market with ready demand, according to Hooi. “Based on our selling price and the types of units offered, we are targeting medium to high-end professionals as the market in Ampang is currently a very hot one, especially in Jalan Ampang, and our development is situated beside it,” he says. However, C H Williams Talhar & Wong Sdn Bhd managing director Foo Gee Jen is of the opinion that it will be quite a challenge to introduce another high-end development to the market in the current environment. “There are far too many high-end residential developments now and even with good take-ups, the actual utilisation and occupancy are very low and may result in a lot of empty units,” he says. According to DTZ Malaysia managing director Eddy Wong, the current market is challenging due to the banks’ tighter lending measures and increase in borrowers’ drop-out rates that have gone up from 10% since two to three years ago to around 30%. He says although people may want to purchase property, some may not be able to secure the financing required. However, he notes that Picasso Residence is situated in a central location and is quite an exclusive development as each unit will come with its own lift lobby and will be larger in size. According to Tan, 1,500 registered their interest prior to a preview held on Feb 7, which saw 48% sales to both local and foreign buyers. With only 472 units up for sale in total, Hooi is optimistic that the development will do well. Both Hooi and Tan believe Picasso Residence will bring something artistic and unique to the current metropolitan concrete jungle. This article first appeared in City & Country, The Edge Malaysia Weekly, on March 2 - 8, 2015.